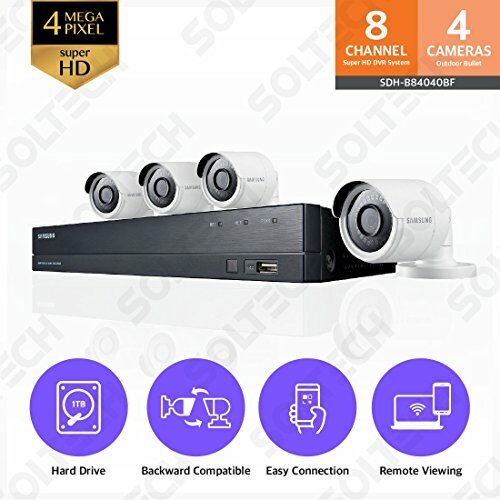 Keep your house or business secure with the Samsung Wisenet SDH-B84040BFN 4 Megapixel Super HD Video Security System, featuring a 8-channel DVR and 4 bullet cameras. Expandable up to 8 cameras total for monitoring. The bullet shaped cameras are designed to withstand adverse weather conditions, including rain, heat, and snow. It delivers 4 megapixel Super HD video, day and night, and provides night vision up to 130 ft. The DVR features a 1 TB hard drive with intuitive menu and controls, making it easy for you to search and review archived videos. By downloading the free WiseView App, you can keep a close watch on your home or business anytime from anywhere in the world through your device. * *PC, MAC, Android/iOS smartphones and tablets.